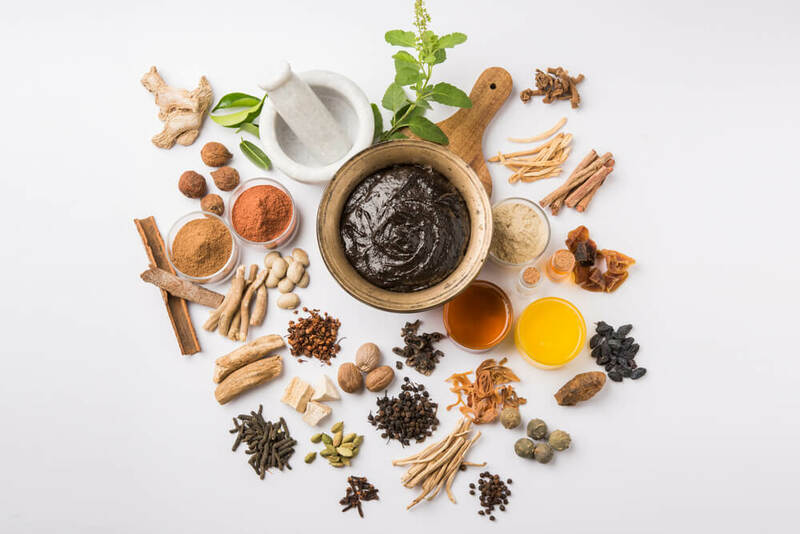 Ayurvedic medicine is a form of healing practice that began in the Vedic culture of India and has been practiced throughout Asia for thousands of years. The Sanskrit translation of Ayur is ‘life’, and Veda means ‘science or knowledge’. The main idea of this practice is prevention. It is meant to prevent and treat illnesses before they become disease through the art of harmony and balance for the individual’s mind, body and environment. Ayurveda is essentially the realization that we all have the power to heal ourselves once we can see and understand how we are imbalanced in our lives, and bring our state of being back into harmony. There are many forms of Ayurvedic healing practices that can be utilized in everyday life. These are essential in creating and maintaining balance. There are several ways to create self-care and balance by changing your eating habits. The first is to eat the largest meal of the day at lunch. This is when the sun is at its highest peak of the day, and it is thought that the digestive fire is also at its peak at the same time. Another important eating tip is to not eat while feeling emotional or distressed. Eating while feeling stressed not only causes more stress to the body but we also have a tendency to eat the wrong foods when we are feeling out of sorts. This can lead to further imbalance by way of an unhealthy diet. If feeling stressed, it is important to calm the mind and relax the body before eating a meal. Make sure to use the six tastes of Ayurveda with every meal. These include sweet, salty, sour, pungent, bitter, and astringent. These tastes can be found in whole foods such as fruits, vegetables, and grains as well as various spice blends. It’s also vital to eat in silence when possible. Eating a peaceful meal can help you to appreciate exactly what you are putting into your body. This creates focus and will help you to enjoy your meal while also giving your body time to realize when it is full. And finally, it is important to take your time while eating. The process of chewing food is actually the first step in the digestive system. If you scarf down food and skip this first step it will make the rest of your body work unnecessarily harder than it has to. Pranayama is a form of breathing techniques and exercises used for creating balance. It is the Sanskrit word for ‘extension of the prana’- life force or breath. There are many forms of this controlled breathing, each with their own characteristic and purpose. There is the Viloma which is interrupted breathing, AnulomVilom which is alternate nostril breathing, and Ujjayi which is victorious breath, just to name a few. It is believed that Pranayama cleanses 72,000 channels in the body which can aid in purifying the respiratory system. The deep breathing of the exercises also enriches the blood with oxygen which in turn benefits organs such as the brain, heart, and lungs. Yoga asanas are a form of yoga which is used to enlighten and elevate consciousness. It brings together breathing techniques, meditation, and yoga poses to create an overall feeling of wellness and balance. The breathing helps maintain focus and relieve stress and tension. The poses improve flexibility and balance while creating a mind-body state of well being by combining the two as a whole. This not only helps the physical state of being but the mental and spiritual as well. Practicing yoga asanas is an essential part of self-care when working towards the goal of overall balance. There are many asanas in the art of yoga. While some may seem difficult at first, there are plenty that are perfect for beginners. Ahbyanga is a form of massage which is performed by using dosha specific oils that have been warmed and mixed with herbs to be used for specific conditions. The oils used are dependent on the season and the personal imbalance. It is also meant to give the feeling of warmth and stability, similar to that of love. This form of self-care is used to restore the balance of the dosha while enhancing overall wellness. There are many benefits of ahbyanga which include body nourishment, firmness and muscle tone improvement, increase in circulation, healthier and deeper sleep, increase in stamina, and calming of nerves. Practicing Ayurveda through the use of these specific applications can provide a perfect beginning to balance and wellness in everyday life. Applying proper and healthy eating routines, daily moments of pranayama breathing techniques, yoga asanas, and ahbyanga massage with aromatic oils can provide you with a well rounded feeling of balance. You will feel healthier on the inside, stronger, more balanced on the outside with a feeling of peace and strength in the mind as well. Practicing these techniques will positively affect each part of your well being. They are as simple as changing how you eat, focusing on your breathing, and giving your body the stretches, balance, and attention it needs.